Aromatic groups can be nitrated by the action of nitric acid and an acid catalyst in the reaction of electrophilic aromatic substitution. When treated benzene ring with concentrated nitric acid at a moderate temperature, nitrations does not occur. But when added concentrated sulfuric acid it will be activated nitric acid by protonation. This protonation and loss of water yield the nitronium ion which is a strong electrophile with much of its positive charge residing on nitrogen. In the first step, an intermediate is formed by nucleophilic attack of the benzene to the nitronium ion. 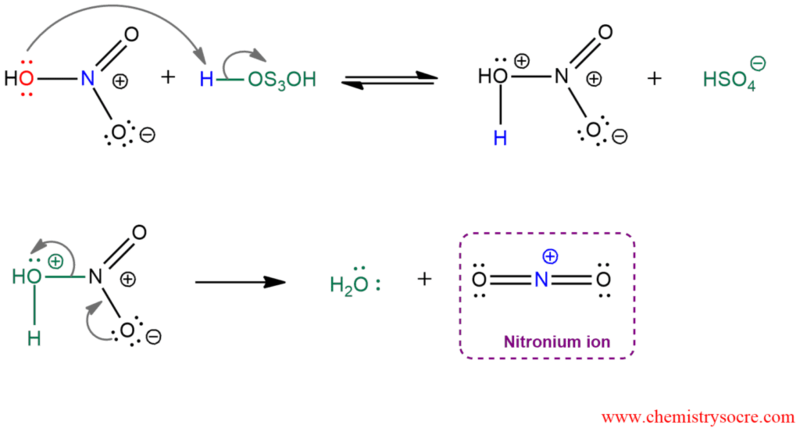 In the second step, this intermediate is deprotonated by water and nitrobenzene is obtained. Aromatic nitration is the best way to introduce nitrogen-containing substituents into the benzene ring. The nitro group functions as a directing group in further substitution and it can be easily converted to an amino group.